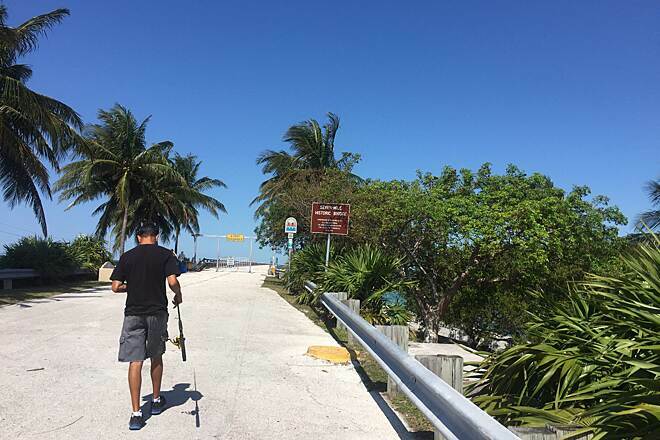 The 106.5-mile Florida Keys Overseas Heritage Trail (FKOHT) will stretch the length of the Florida Keys, from Key Largo to Key West, the southernmost point of the continental United States. The trail is also part of a larger effort called the East Coast Greenway, which will link multi-use trails from Florida all the way to Maine. Currently, more than 75 miles of the FKOHT have been paved and completed. For the rest, users will have to share the road with vehicles. The trail runs parallel to US Highway 1. Use extreme caution as some areas have narrow shoulders, causing potentially dangerous traffic encounters. The trail is also quite exposed, so bring lots of sunscreen. Tracing the course of Henry Flagler's old railroad line, FKOHT includes 23 of the rail bridges, the longest of which is 7 miles. Some of these have been converted back to their original configuration, but with added safety rails and an asphalt surface. 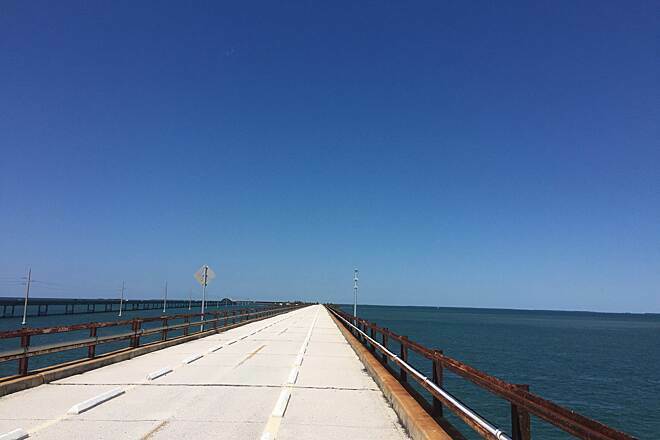 To accommodate fishing, platforms have been added to some of the reconditioned spans, including the 2.2-mile Long Key Bridge and smaller spans at Channel 2, Toms Harbor, and Toms Harbor Cut. 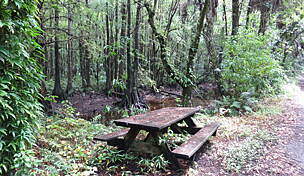 In addition, the trail links a number of superb natural areas and historic sites. Parking is available in many places throughout the Florida Keys. 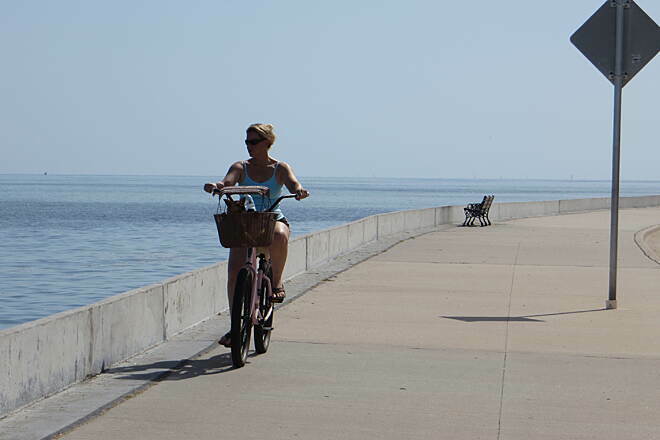 For detailed route information traveling from Key West, visit the FKOHT northbound route map. 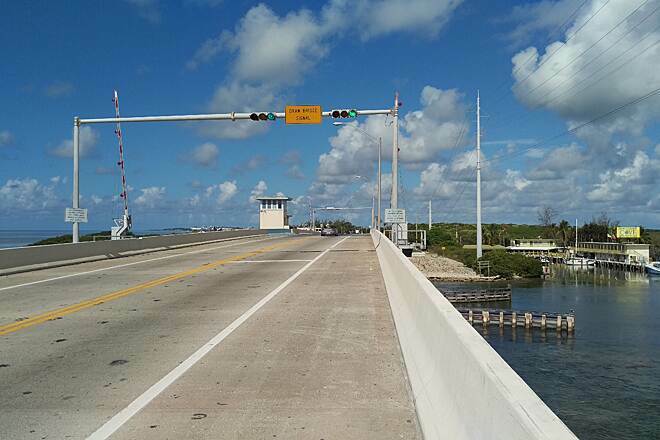 For detailed route information traveling from Key Largo, visit the FKOHT southbound route map. 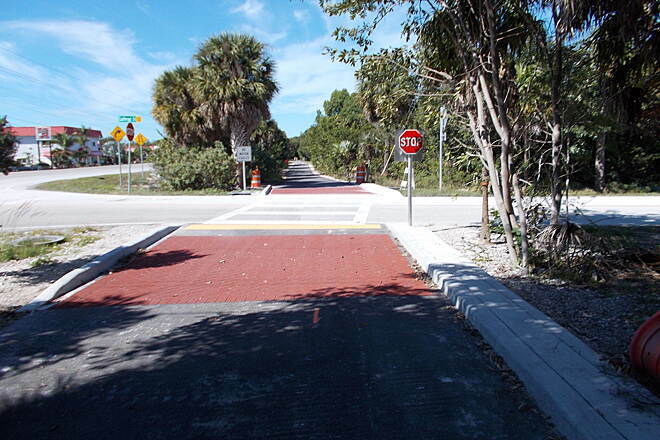 It appears FL DOT is removing part of Heritage Trail in Marathon Key! How disappointing! It appears the DOT is going to remove a full half mile of the trail that is already established! Making an extra car lane out of it - I suppose to support new development on Somberro Road (a developer wants to tear out more natural treed area and put in 50 plus units - so I guess they need to make the road wider for cars too!). 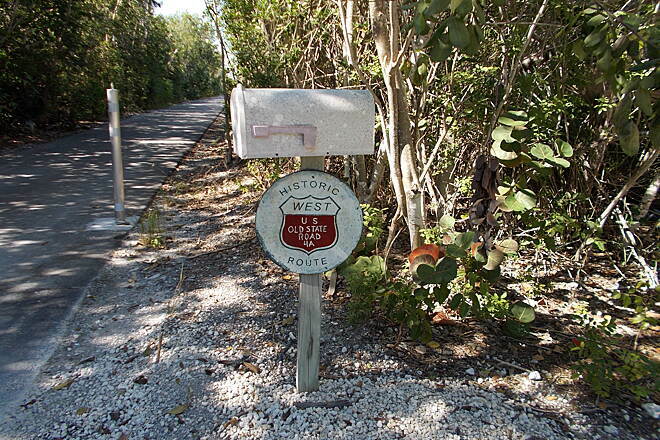 From Key Largo to Key West the trail is off and on. 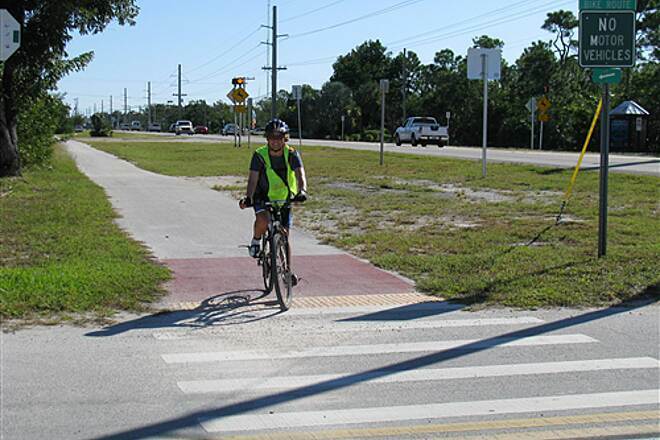 The FDOT is playing games with cyclists lives to get budget . On several bridges the FDOT upgraded rails and other improvements to separate the trail from the two lane over crowded US 1. To then turn around and close the bridges to put cyclists back on the hiway with very narrow shoulders is either incompetent or contemptuous. The trail has numerous switchbacks across the hiway. Every crossing of this hiway is a big risk. 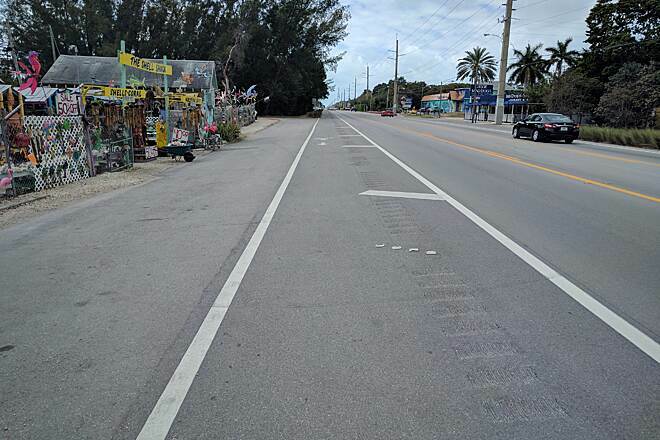 The number of bicycle crosses on the roadside is testament to FDOT callousness. 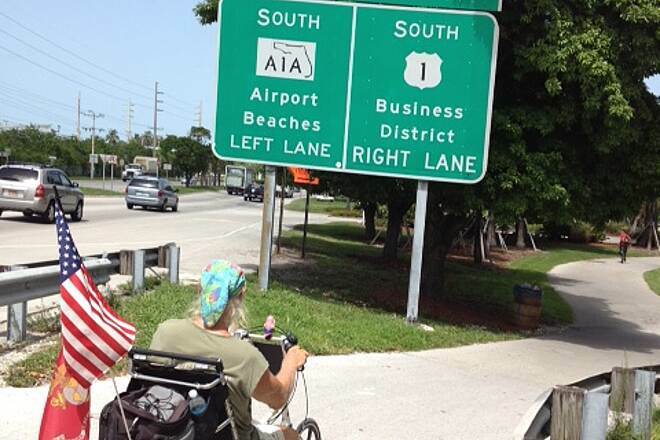 Congratulations to the Florida park system for completing a new trail section from mile 105 to mile 100 (at the red light)on the north or bay side of Rt.1. There are now trails on both sides of Rt. 1. However for some reason many of the old bridges have been fenced off destroying any type of continuous biking in many spots. The trail parts are very nice. The parts where you ride along side the highway and over all the bridges are scary. The road is very busy all day, with lots of big trucks going up and down the highway. The shoulder where you ride is covered with all sorts of debris, creating a real obstacle course. Those parts of the ride killed the enjoyment for me. 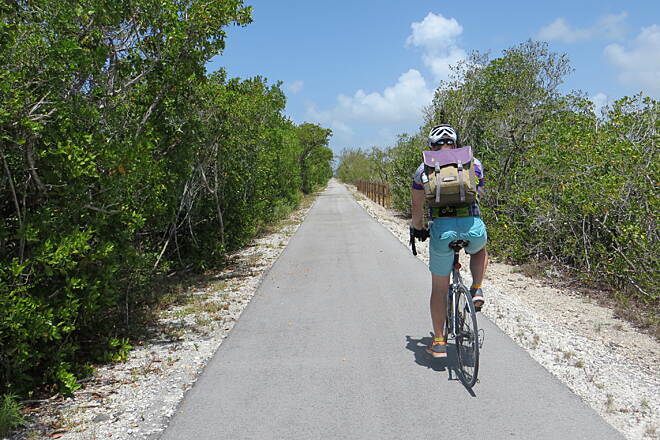 Rode the Heritage Trail from Stock Island to Lower Sugarloaf Key (and back). 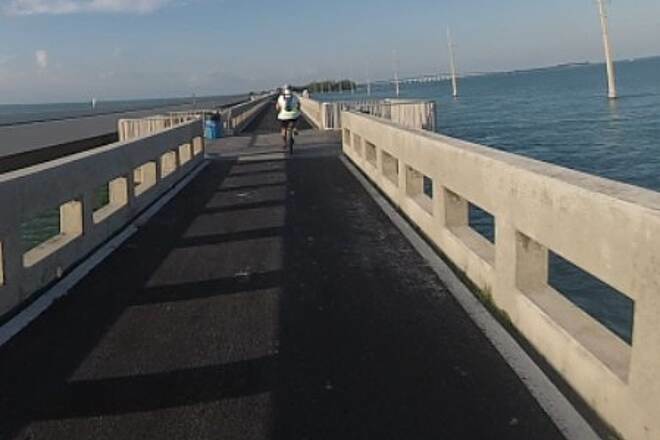 I would have loved to have gone further, but 13 1/2 miles out from Stock on a Fuji rental bike (after three days of cycling around Key West in the humidity) was more than my bum was ready for. Would love to go back with my own bike. 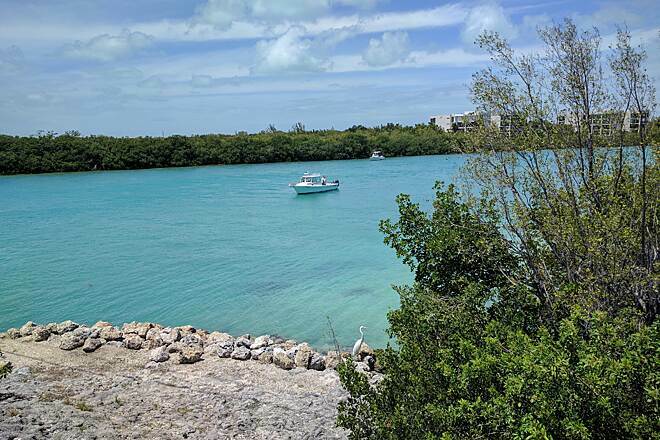 Trail is extremely well maintained, the views are spectacular, and the hundreds of iguanas that you will see along the way will reluctantly skitter off to the side as you approach! This trail is made for cruising, but you will want to stop many times along the way to just LOOK. My Catrike Expedition is 30 inches wide so I did not plan on riding the segments where the "trail" consisted of a three foot wide strip on the edge of the two lane highway, but I was greatly disappointed that so many of the new bridges were closed and fenced off by the state of Florida which require more riding of those three foot wide strips across the bridges. I cannot imagine why the state would close off perfectly good bridges and force bikes to mix it up with car and truck traffic. Other than that, there were many nice segments of the trail finished. My rides consisted of unloading the bike, riding as far as I deemed it to be safe, turning around, riding back, loading up, and driving to the next ridable section. My wife are from UK and have just competed the trail in mid April. First for us Brits the heat was a surprise and so tried to start early and get to our destination early afternoon to cool down and chill. 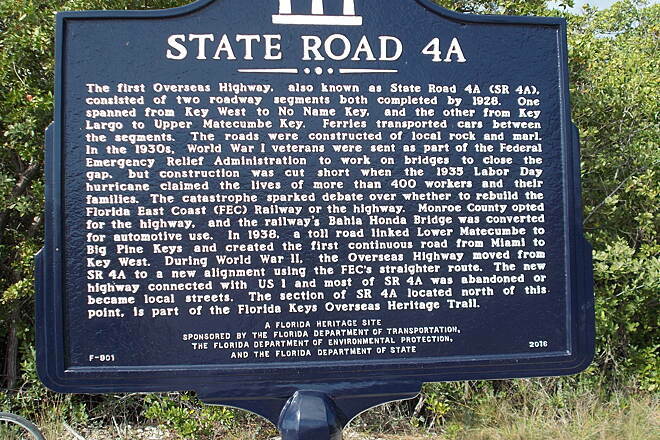 Key Largo and US1 on a Friday evening was a major shock for traffic! once we got to Tavernier and then further south the ride was enjoyable. We had not appreciated the amount of the trail actually on route 1, but once away from US1 the trail was great. We like the fun of the fishing bridges, and the old state route. All the diners and cafes we were recommended were friendly and good along the way ,plus helpful bike shops when needed. Yes we had to change two tubes and one tyre. But that is the luck and fun of biking! 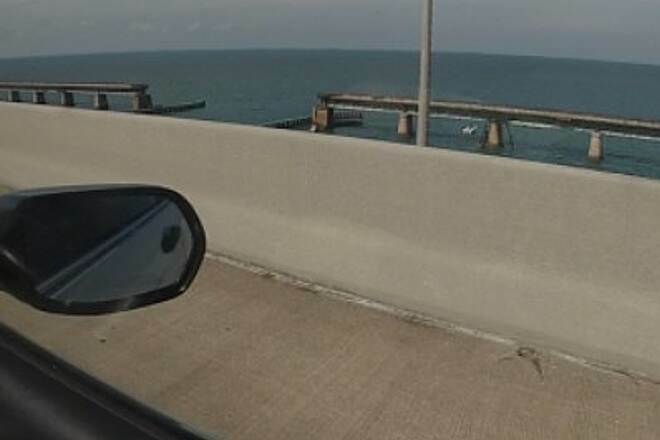 On the big question of 7 mile bridge we got a cab, and from the back seat of the cab it did not look like fun! We met some Germans also doing the trail, who also took a cab over the bridge. It is clear work continues to complete the trail, and it should be good when done. Ever thought of a ferry as an alternative to the 7 mile bridge? We are already looking at other trail trips in US based on our experience. 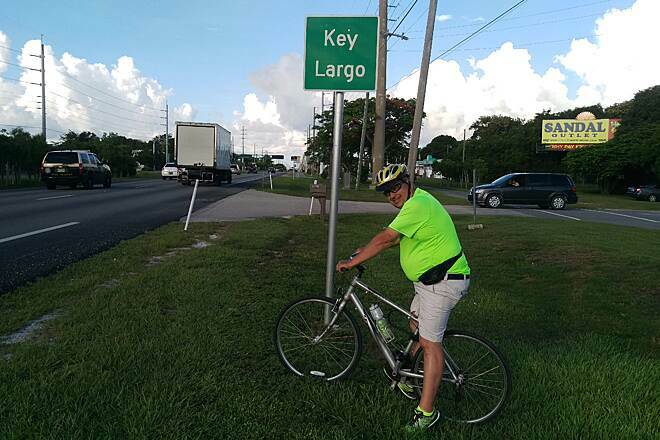 I set out from Key Largo for a two day ride to Key West in March of 2015. I was totally disappointed. 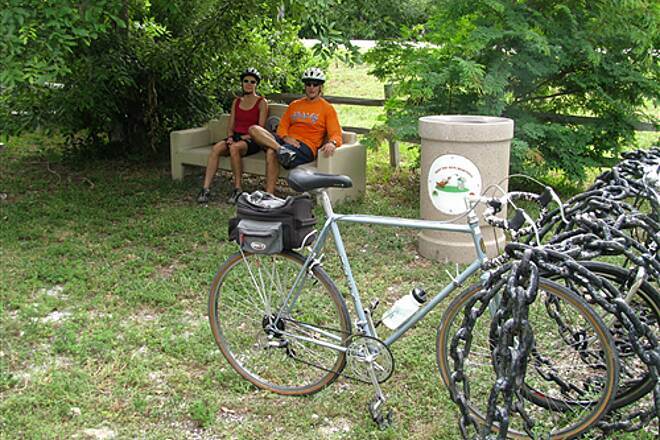 The Florida Tourism Bureau needs to take this trail off off the list. The 106 miles is more of a chopped up mess of haphazard trails. It follows one of the busiest two lane roads in the country. Not only does a rider have to ride most of it on the shoulders,you have to switch from side to side because of the shoulder width. Crossing the two lanes can take several minutes due to the constant traffic. For the most part the trail in the towns is a sidewalk. Drivers jet from the convenience stores and gas stations without giving the bicyclist a thought. 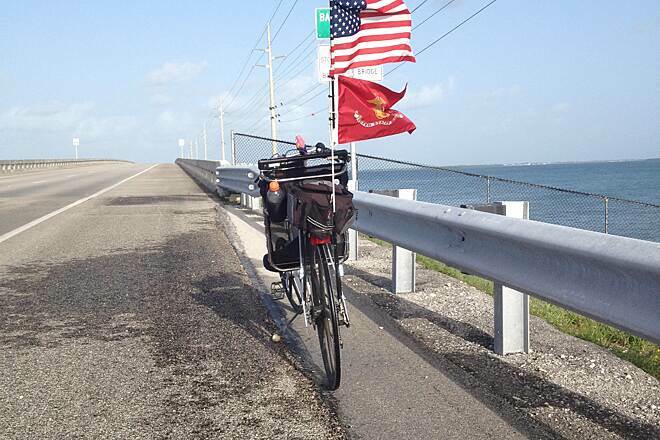 Shortly after the Seven Mile Bridge crossing I stopped a Florida State Trooper. I asked him where the trail was. He laughed and said there was no trail. He admitted he was a cyclist and said he would not ride his bike "out here". I would not recommend using anything other than a hybrid. Large gravel is everywhere. I had two flats. One was caused by a piece of wire. The other looked like glass. 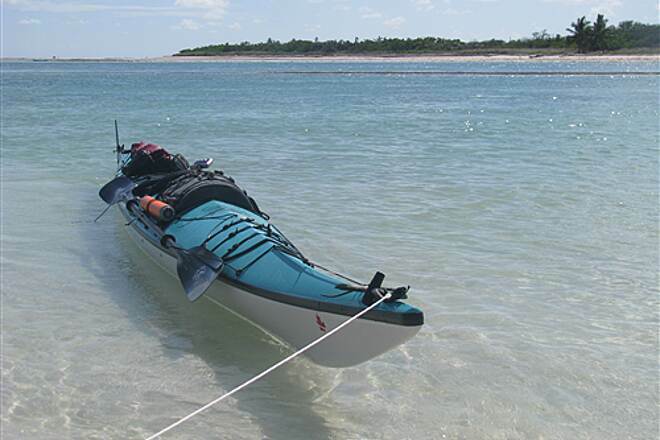 Trial was good in Marathon.A side trip to Sombrero Beach is a must.If you need to rent Overseas Outfitters is great.$15.all day.Located just north of the 7 mile bridge. Rich Burke Easton Pa. It was great trip. Trails were fine and when sharing the road with motorist there was no problem. 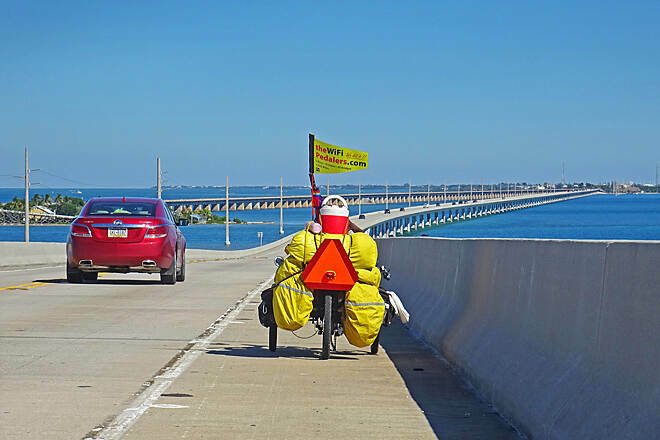 We( 4 of us) were nervous about the seven mile bridge and the trails to follow on our way to Key West but we had no problems.We did the ride in two days so we were able to cross the seven mile bridge early in the morning which I strongly recommend to avoid traffic. 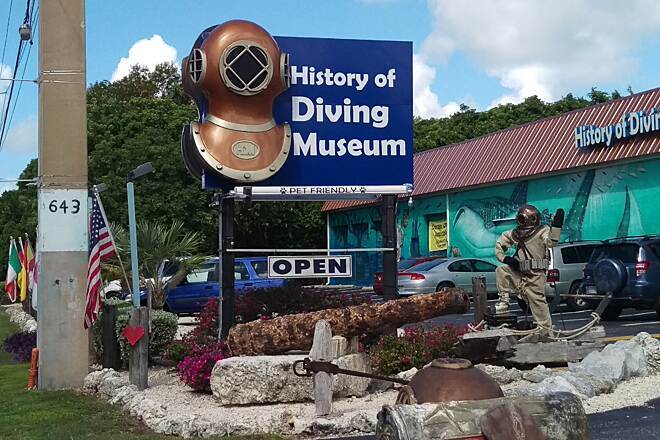 Construction around Key Largo was a little bit of a pain but bearable. There was four of us biking and we were all pleasantly surprised how much bike path there actually is. I would recommend this trip to everyone it was wonderful! PS we are not serious bikers, we cruise between 12-14 MPH! After looking through some of the other reviews the only conclusion is that maybe at this time the ride is not for beginner cyclists or those who are nervous around traffic. The trail network itself is wonderful but it is not complete so there are many area where you have to mix with and ride with traffic. With that said I have never had an issue with any motorists on the route. I live in North East Ohio and have done the entire out and back ride 5 times. I love it for the scenery and looking forward to riding it again next week. I would not recommend using a skinny tire road bike but my cross bike with 35's is perfect. You can go to the FKOHT site and on the right hand side is current construction status'. My wife and I are thinking about riding the trail in December. Does anyone have a more recent review of the trail conditions? Has there been significant work accomplished over the summer? Yes lots of construction, trail changes weekly! Needs a lot more signage! Rode on hybrid tires and had no problems. Stayed in motels along the way with no problems GREAT food! Rode 162 miles with all the side trips over 6 days. 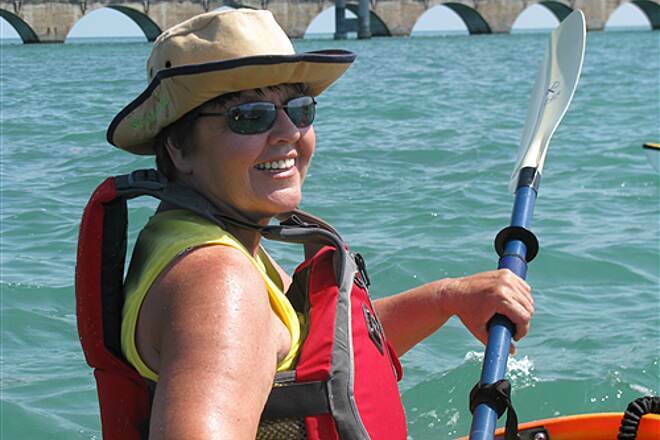 Not a wilderness adventure, 7 mile bridge shoulder was 5 feet, was the hardest. But we will do this again! Should be Called "Trail of "DIS-SPARE"
Because you are going to need a lot of spare tires if you expect to log any mileage at all. 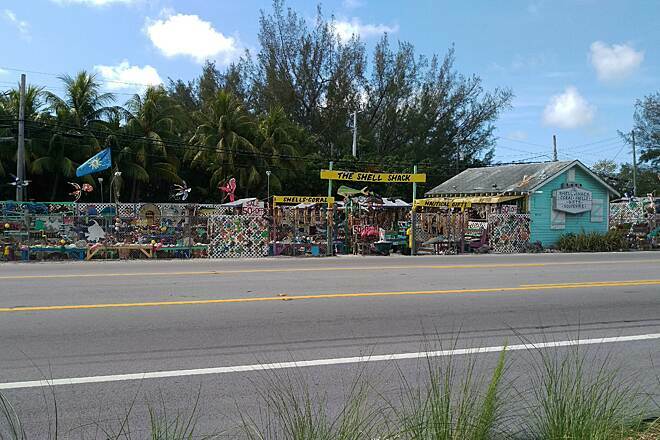 I am from Ohio, drove to Key Largo in hopes of logging some awesome mileage, no to be. Do "Not" bring your road bike here, tons of traffic with disrespectful drivers that break the three foot law almost wanting to hit you, cyclist haven't any road rights here. Now if you want to lumber down to the local shell shop on a fat tire bike, you may be ok, but use caution at the crossroads. 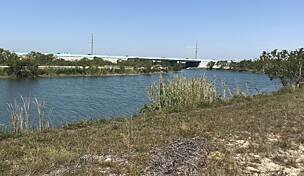 As a tourist attraction I am very disappointed that the powers that be have not taken an interest in maintaining this what could be a treasure of the keys and a possible cycling mecca. I rode the Trail in January/February, 2014 and would like to share my observations. First, in many places, the Trail is basically a sidewalk/path, within a few feet of busy, noisy, dirty US #1. It's also sometimes very narrow and intersects with numerous driveways and side streets, in other words, not very tranquil. 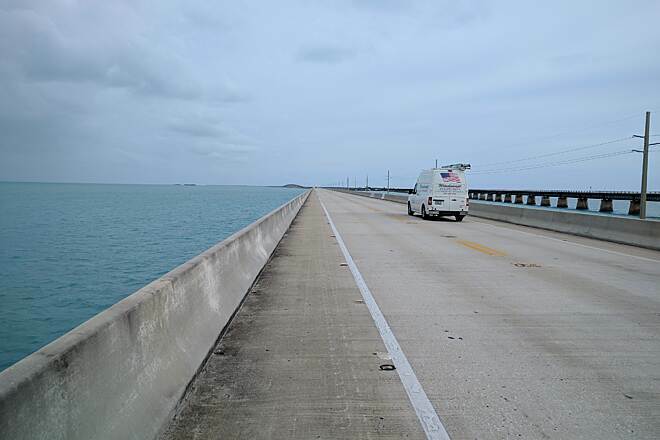 Through riders will need to cross numerous bridges on highway shoulders, including the "new" seven mile bridge. This may be a challenge for novice cyclists. There is also a lack of parking for those cyclists who choose a do a section at a time as the Trail sometimes "disappears" withour notice. The 2015 completion date for the trail is too optimistic!The highlights of the ride are the old bridges which are open only to pedestrians and cyclists, although cyclists will need to dodge fishermen and their assorted garbage and equipment. 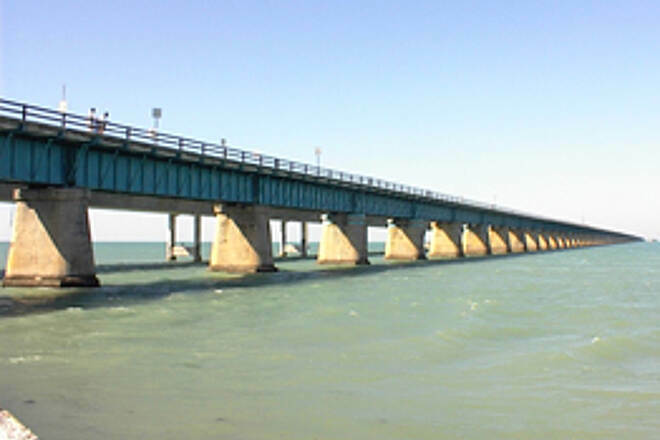 The old seven mile bridge is awesome, even though it only goes two miles. 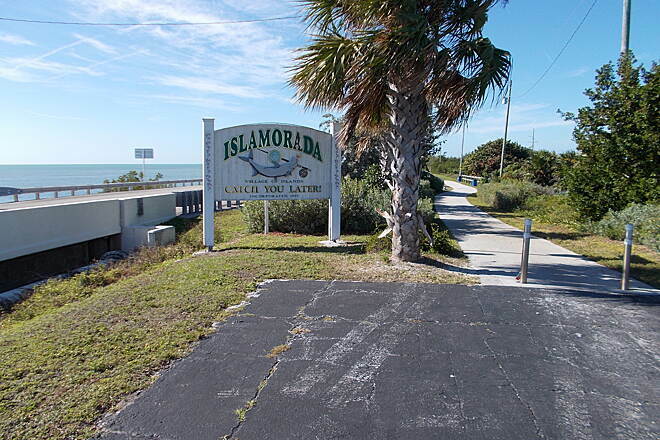 It costs $12 to set foot on Pigeon Island at the end of the bridge! The various keys are installing a sewer system which in January 2014 means lots of construction problems which are not noted on the FKOHT web site. Around Mile 106 to 104 or so is pretty rough but it is being finished fast and then paved wider and better. The back roads on Plantation Key, Widley Key and Islamorada also have some construction. If you ride the shoulder on US Rt 1 there is not a problem but I do not. Jan 13-16, 2014. Picked up the trail in Islamadora, near a bridge that had parking. The trail passes across many housing/business entry ways. Care must be taken at each point. The trail requires crossing US-1 several times. Generally good pavement; occasional bumps/debris. Several 'bike /fishing only' bridges allowed us a fun ride across. Unfortunately several bridges you must ride the often debris laden shoulder with 55 mph traffic; we didn't. Most old adjacent bridges are blocked so you can't ride safely. Some trails were freshly laid, and active construction on others. 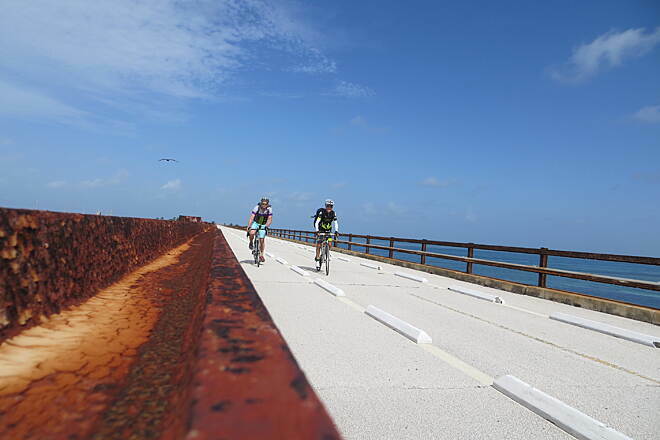 As we drove the car from Islamdora to Key West, we noticed some areas (Marathon) that had bike bridges and newish safe trail lengths. Recommend starting in Marathon for those wanting to stay over and ride some trail distance without traffic issues. 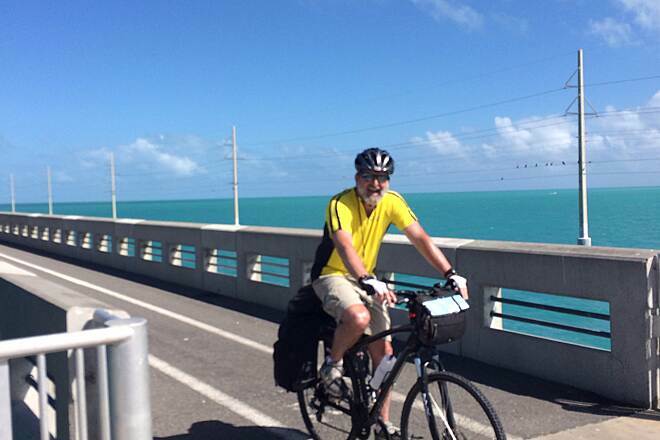 Short but nice ride to or from Key West to mile 8. All off the highway along dedicated path. 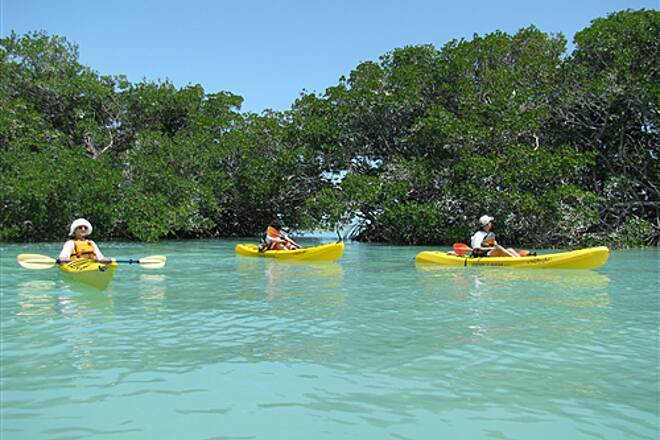 In Key West there are several options to pick up a few more miles. I started road cycling about 8 years ago when I decided that it might be fun to bike with my son's Boy Scout troop 419 miles around the Gold Triangle (Skagway, Alaska to Haines, Alaska) Well, it was fun and I was hooked. Living in AK our cycling includes lots of rain and in some cases very steep terrain. Not to mention some pretty cold days. So I started looking for something a lot less challenging and warmer, but not too warm that it was uncomfortable. I connected with RTC and found The Overseas Heritage Trail. 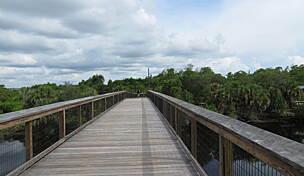 This trail was perfect because it was mostly flat and the weather in FLA in the winter and spring was just as perfect. 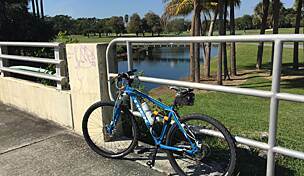 So with my trip planned and bike rented I was ready to begin my FLA cycling adventure. Since that first 100 mile bike ride, I have since biked it 3 more times and I plan on biking it again in March. I absolutely LOVE this trail. There is so much beauty to see that sometimes it's hard to focus on the rode. 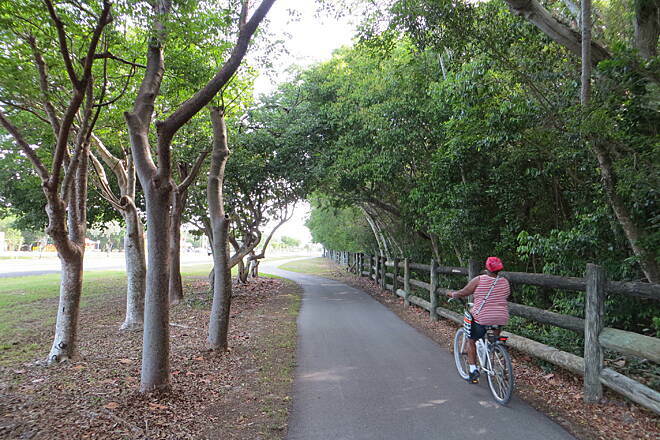 If you plan on biking this trail, focusing on the trail is very important. 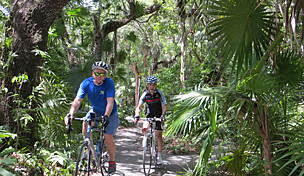 The trail is improving every year and I was told that by 2015, there will be a bike trail from Key Largo to Key West. This past March about 80% of this trail has a bike lane. In some spots the bike lane flows against traffic so you have to cross the highway. In some spots it's not worth crossing over however, in some spots the road is pretty narrow and you will want to use that path. I know I have read that some folks have encounter debris on the highway and this is correct. Most of it is very visible and should not be a problem as far as flat tires are concerned however, always travel with a spare or two just in case. 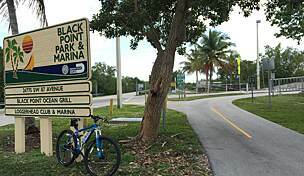 It is very easy to bike this trail in one day however, if you want to see the Keys, rent a hotel room along the way because each Key has something wonderful to offer you in terms of food, drinking at great beach side bars, visiting a Turtle refuge or dolphin habitat. You will see wildlife along side the road as well. 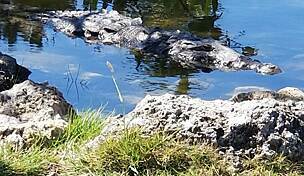 I have not yet seen a gator and I hope not too. 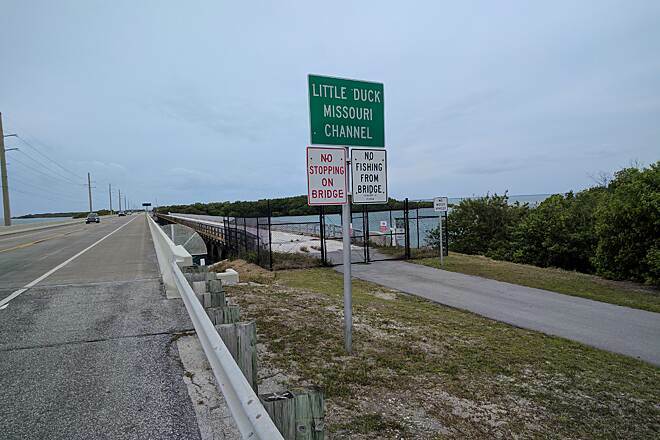 For those of you that love a challenge, this is such a fun trek to see if you can make it to Key West from Key Largo in under 5 hours. The winds are just wonderful and when I bike it I always give myself plenty of time to watch the winds so that I can choose a day when I will have the wind on my back. 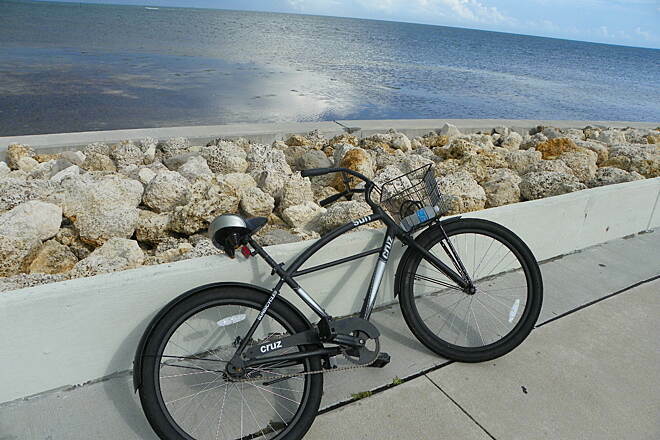 Tailwinds are great for cycling from Key Largo to Key West. This is definitely a trail that you can bike with you teens, anyone younger I would only recommend doing short distances a day and when there is not a trail put the bikes on a bike rack and drive it! 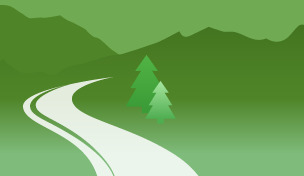 There are too many vehicles to enjoy this trail if you are worried about your little one. If you are thinking about a fun, warm cycling tour, the Overseas Heritage Trail is the best and I HIGHLY recommend it! Rode the trail in May 2013. 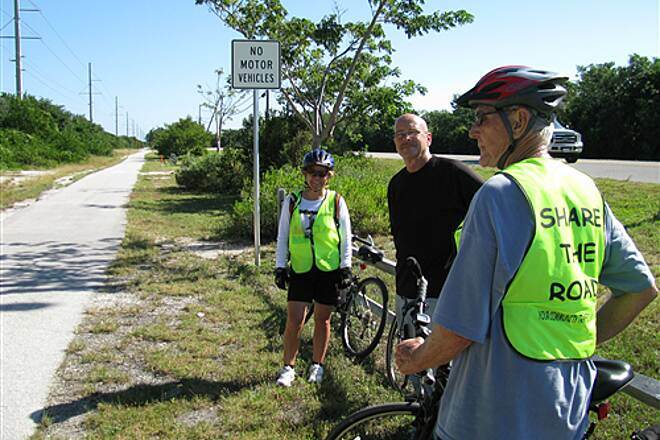 We started in Florida City and did 22 miles along highway 1 before the trail started in Key Largo. Encountered lots of rain and wind in the morning hours that turned into a great afternoon ride to Marathon. 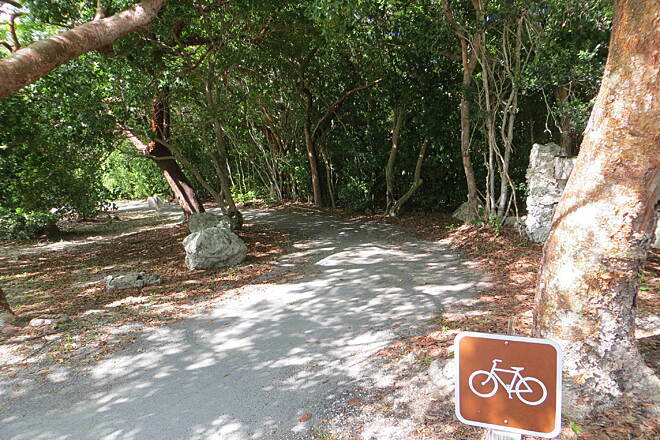 The trail in Key Largo was underwater from the rain in several places and quite rough in others. With a marked trail along the road we had to be careful of cars entering and leaving the roadway. About mile 92 we lost the trail for a bit and then found it again. Parts were dug up for a water project that was going to result in a restored trail after. 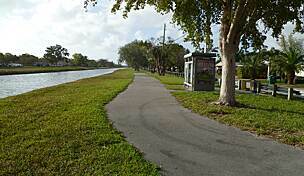 Some of the trail was away from the roadway and along the waterway. Iguanas sunning themselves would run in front of the bike. 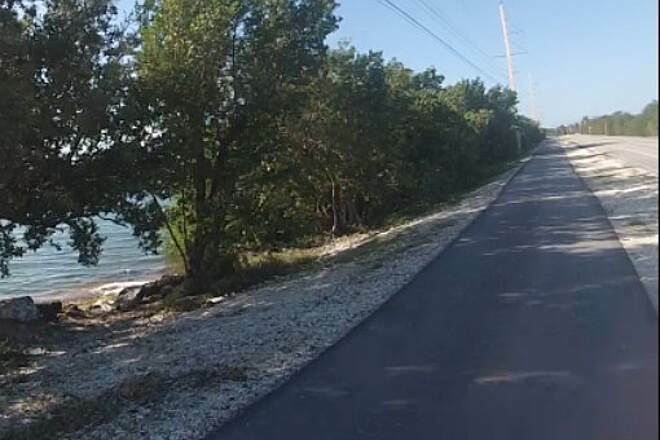 The last fifty miles into Key west were better but used the shoulder in many places where the trail was under construction. 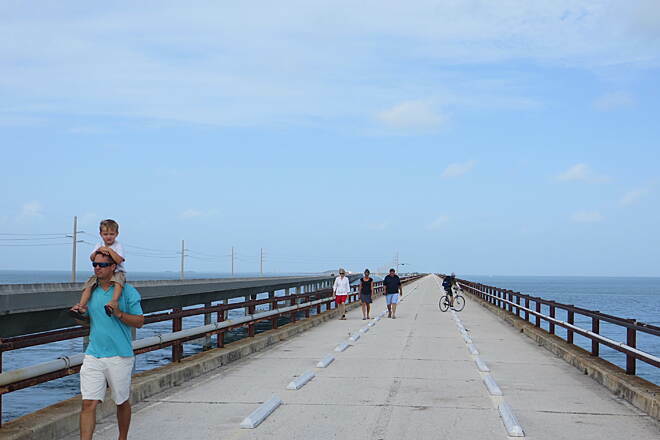 Seven mile bridge was a lot of fun and you did have to watch for debris along the road. Three riders and four flats from radial belts means be prepared to change out some tubes.want to do it again and know it will get better and better. 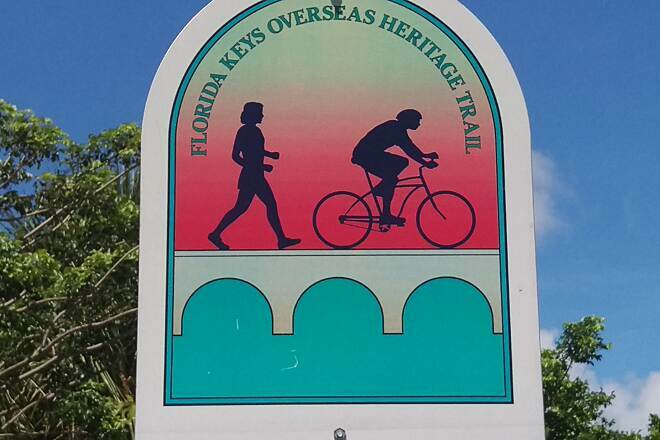 During the 1st week in December the wife and I rode the Overseas Heritage Trail from Key Largo to Key West. We began our trip by traveling down to Florida on the Amtrak auto-train, with our bicycles & gear loaded in the back of our station wagon. 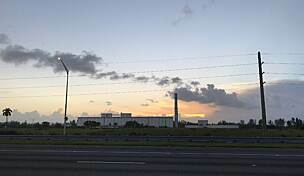 Driving from Sanford, Fla to Key Largo took 6 hours. 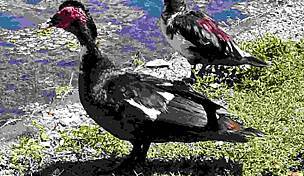 We stayed overnight at the Marriott Key Largo Bay Resort that is located at ~M103.6, and made arrangements to leave our car there for the duration of this excursion. We accomplished the ride over the course of 4 days averaging a very modest pace of 25-35 miles per day (includes side trips), averaging 9-10 mph and approximately 3 hrs of wheel time each day. Winds were out of the N/NE and were at our back for the entire ride! 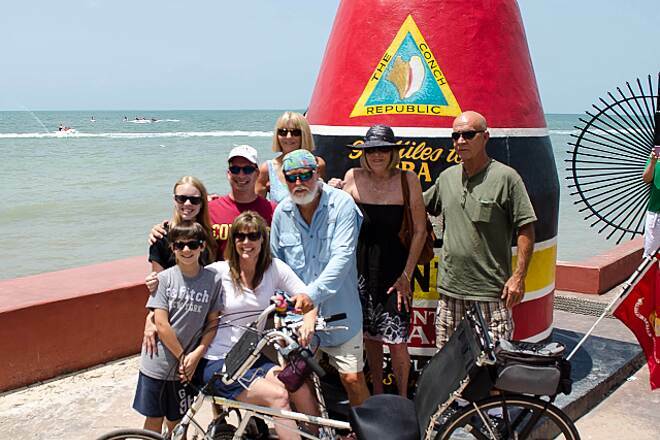 We also stayed in Key West for 1 extra day so that we could do sightseeing and be able to ride the 10-mile loop around its perimeter. To carry our clothing and gear we utilized a set of rear panniers on my bike. Both of us had a rear rack top bag and a handlebar bag. In total this weighed in close to 55-lbs, with maybe 40-lbs on mine and 15-lbs on my wife’s. Our bicycles are relatively inexpensive 18-spd 26” trail bikes (Raleigh and Trek) with 26x1.95 tires that are slick on the center. With 60-65-lb inflation they roll fast and make for a comfortable long-day touring ride. 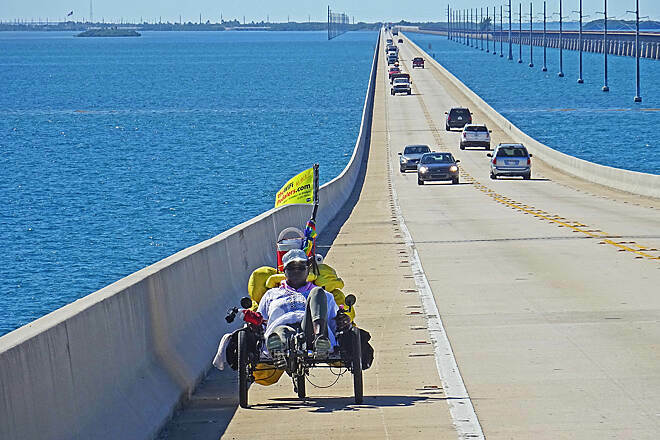 Our stop points for this ride were as follows: Day 1 - Islamorada – Hampton Inn & Suites; Day 2 - Marathon – Holiday Inn Express; Day 3 - Little Torch Key – Dolphin Marina; Day 4&5 – Key West – Best Western Hibiscus. We utilized the Trail Map and Ride Directions that are available on the Overseas Heritage website. The map is dated Nov-2010 and the ride directions dated May-2011, but they are still quite accurate. 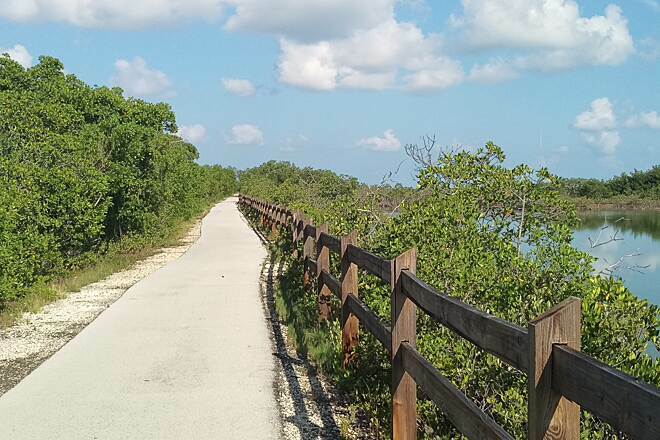 Between Key Largo and Marathon riding on the established trail (or along the old US-1) is pretty simple and straight-forward. Throughout this area the trail is well marked, and changes from ocean-side to bay-side are well marked with crossing lines. 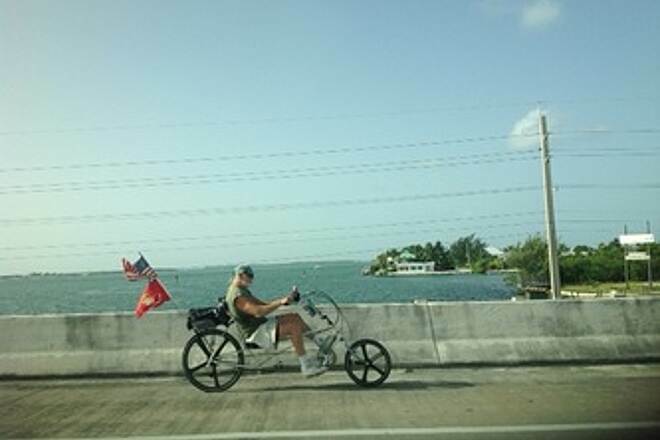 However between Marathon and Key West the complexity of the ride changes significantly. From Marathon to Big Pine Key there is almost no trail, and most of the ride must be done on the shoulder of the road. Fortunately each of the bridges to be crossed have a really nice, wide shoulder area (6’ or 8’) to ride across on. We did not encounter any serious road debris (i.e. tire chunks) and almost no broken glass. From Big Pine Key to Key West the small segments of trail seem to flip back and forth from bay to ocean side and back again with no apparent pattern. Sometimes the bicycle lane is marked on both shoulders of the road. 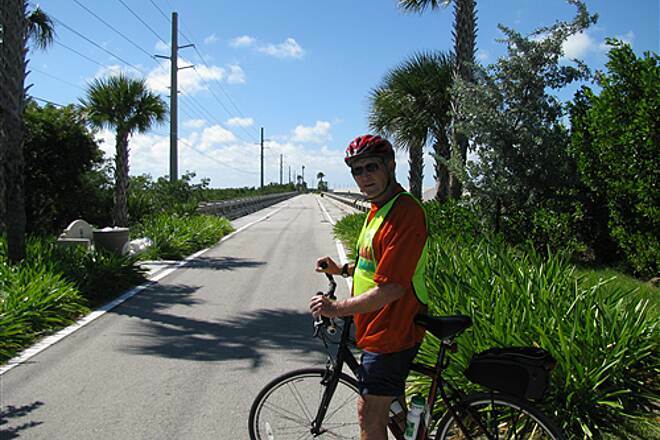 In most cases the trail bridge crossings in this lower region (where they exist) tend to be on the ocean side – on the opposite side of the highway from where the road shoulders are marked as a bicycle lane! I can tell you – trying to cross back and forth is a dangerous thing to do on US Rt 1 at any time of the year. 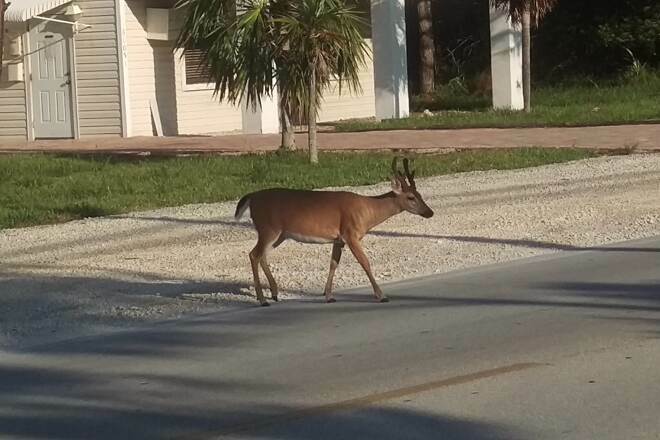 Speaking of time of year – this first week in December is probably the “slowest” part of the season throughout the Keys. Hotels had plenty of room, restaurants were not crowded, and the road traffic was pretty much from local residents as opposed to tourist &/or snow bird traffic. 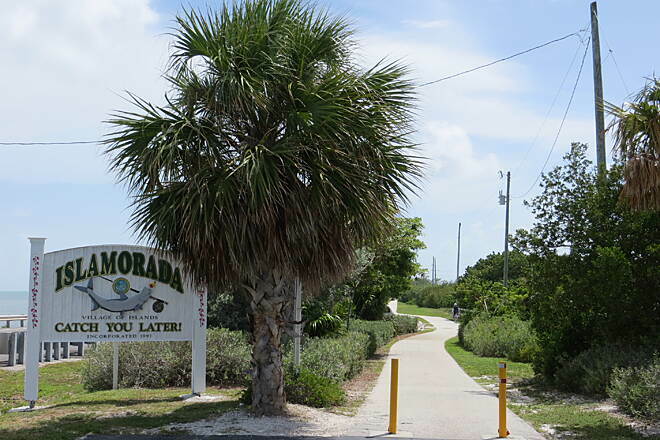 The trail improves significantly as you travel away from Key Largo. 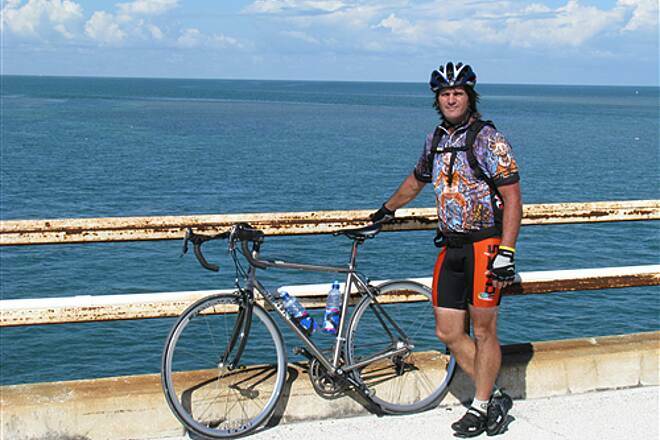 Traveling from Big Pine Key to Key West is great although some of the ride is on the highway shoulder. Ride Early to avoid the traffic. 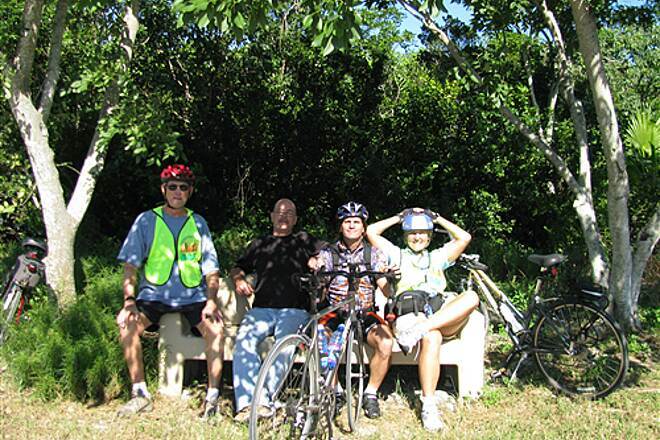 "My wife and I rode our recumbents on the Overseas Heritage Trail this afternoon. 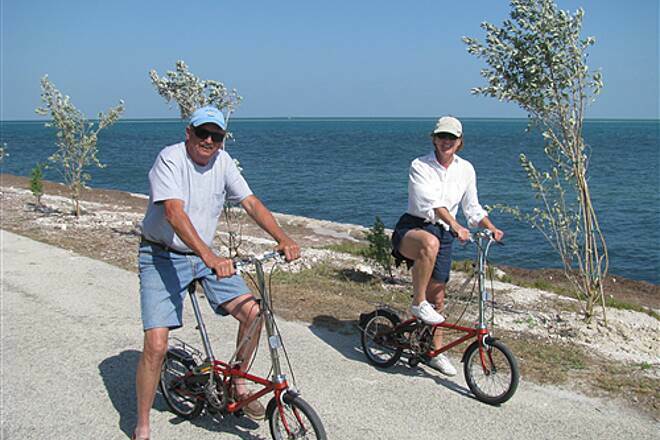 We began our ride in Key Largo and rode south for about seven miles. The trail is right next to US1, a major highway. It's too noisy with cars, trucks, motorcycles, etc. in close proximity. The trail is in serious need of repair. There are holes, rocks and bumps all over the place. 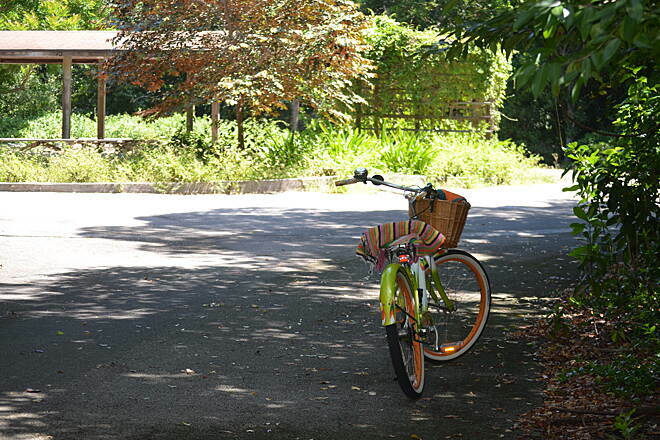 The only nice part of the ride is that we decided to turn off the trail every chance we got and rode down nice quiet neighborhoods. We enjoyed a peanut butter and jelly sandwich lunch down the end of one street that led to the water. I would rate this portion of the trail as poor. Hopefully it gets nicer further south."